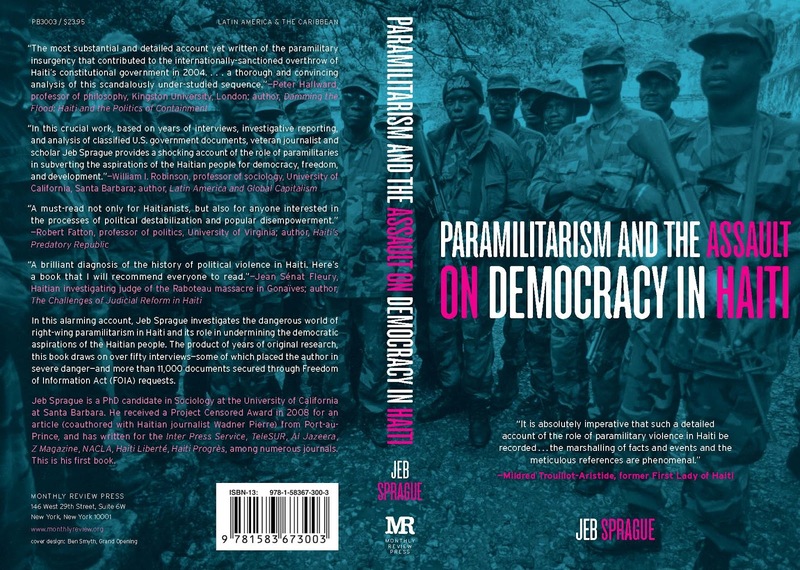 My 2012 book "Paramilitarism and the Assault on Democracy in Haiti" provided a detailed documentation and investigation of paramilitarism in Haiti in the lead up to and following the 2004 coup d'état. It looked at the manner in which paramilitary groups (and those facilitating them) altered from the Duvlierist era up through the early twenty first century, ensuring a reproduction of the coercive paramilitary apparatus. Below I want to look over some of the discussion that the book has sparked. Most importantly, the book uncovered: (1) how US,UN, and OAS officials between 2004 and 2005 closely oversaw the integration of paramiltiary death squad members into Haiti’s post-coup police force; (2) the role of Dominican government officials, specific Haitian elites, and what appears to have been the activities of French and U.S. intelligence in facilitating paramilitary violence in the years leading up to the coup-- going into much greater detail and investigative work than even Hallward’s (2008) excellent study; (3) the complex and difficult to piece together chronology of the paramilitary "contra" campaign (through an immense amount of FOIA research and interviews); and (4) how under Haiti's democratic interregnum (1994-2004), for the first time in the nation's history, there was a concerted judicial effort to bring to justice rightist paramilitary gunmen and their financiers. The book has received positive reviews (Anglade, 2014; Barker, 2012; Davidson, 2016; Fernandez, 2012; Kaussen, 2015; Pierre, 2013; Podur, 2014; Poinsette, 2013; Scherr, 2012; Smith, 2013; Taylor, 2013; Terrall, 2012; Tomes, 2012; Wisskirchen, 2012). However a few authors have also made criticisms of aspects of the book, such as, that (1) it did not theorize well enough the phenomenon of paramilitarism (Gutiérrez, 2015), that (2) it emphasizes too much the role of agency, but not enough the structural conditions (Gros, 2015), that (3) it failed to theorize and analyze the nature of the "failed" or weak state (Gros, 2015), that (4) the book at times exhibits "a certain kind of determinism in explaining the actions of the popular classes and elites" (Smith, 2014), that (5) it was too uncritical of FL (Fanmi Lavalas), as Gros (2015) claims from a liberal point of view that the FL political project aggravated the "formal structure, such as the state, and the informal rules and norms embedded in culture", or, from a left perspective, that the book was too apologist for the relatively moderate policies of the Aristide government (Gutiérrez, 2015), that (6) the book's conclusion includes a haphazard mention of the conflict in Colombia (Gutiérrez, 2015), and (7) that it failed to recognize that paramilitarism is actually rooted in a culture of banditry and the lack of a local culture of forgiveness, for example without the existence of the word "sorry" in Haitian kreyol (Gros, 2015). On points 1 and 2 I completely agree, and these are issues I have tackled in some recent and forthcoming publications (Sprague, 2017, 2018, 2019). On point 3 I agree partially: the analysis of paramilitarism does need a better theorization of the role of the state, however I do not agree with the "failed state" argument that Gros (2015) believes my book needs. The “failed state” approach of many political scientists tends to place most of the blame for "failed states" on the role of local state officials, rather than to contextualize the weaknesses of these states through underdevelopment, colonialism, imperialism, and for instance, the role of powerful interests in undermining progressive, leftist, and statist political projects, and how different social groups and forces congeal and operate through state apparatuses. On point 4, Smith is largely correct; the book does need a more nuanced explanation of class conflict and class relations, recognizing more clearly the many contradictions and various intermediary groups and complexities of social reproduction and contingent relations. For point 5, yes, it is true that the book could look more critically at the policies of FL and its officials, but as these criticisms have been repeated ad nauseum and often in ways that completely ignore the struggle and positive achievements of the Lavalas movement and the FL administration, I felt compelled to focus my narrative on the underreported and largely uninvestigated role of powerful groups in undermining and overthrowing the country’s popularly elected government. I felt compelled to draw attention to the unreported violence by rightist paramilitary groups that targeted so many from the country’s popular classes. Also, as elaborated upon in my book, I do agree with some of the criticisms of FL that Hallward (2008), for instance, has made, as in regards to its disorganization and some of its compromises and failures. On point 6 I completely agree here with Gutiérrez (2015), that my brief one sentence digression into discussing Colombia in the conclusion of my book should have been left out, as this was based upon some interesting comments made to me by a former Haitian narco-trafficker that I interviewed, but which distracts from the main points in the conclusion. It is odd though that Gutiérrez dismisses the entire book because of this one digression. In regards to point 7, in my view Gros blames Haitian culture for what is so obviously foreign and domestic elite sponsored violence over these years. Could he really have missed that US troops and paramilitary forces - not his so called "bandits" - actually carried out the coup and pre-coup and post-coup paramilitary violence? At one point Gros (2015), in his review of my book, describes Emanuel Constant (the founder of the FRAPH death squads) as a popular figure. Where does he get that? Would he have been as popular as the founder of FLRN, Guy Philippe, who in the 2006 election was able to win a massive 2% of the vote? Shouldn't the defective culture have registered some impact at the polls? And was the "popular" Constant shielded in Haiti - by its defective culture - or through the activities of the U.S. embassy, the CIA, and their local allies? Gros' review stands out in that it feels as if it were written by two people: the first half careful and reasonable, the second part by someone that possibly skipped over much of the book. In regards to his claim that no word for “sorry” exists in Haitian Kreyol, he must be aware that phrases with similar meanings exist: “Mande Padon” to ask for forgiveness, or, depending on the situation, "dezole, ekskiz" for saying sorry for a simple mistake. A few of the reviewers of my 2012 book likely skipped over large parts of the text, such as appears to be the case with Gutiérrez (2015). Much of my 2012 book was written while I was focused on investigative and historical research, and had not yet integrated this with enough of a political economic approach. For that reason, I have in this new article (which is in French here, and with an altered English version in Third World Quarterly) provided a brief breakdown of the findings and argument of my 2012 book alongside a more structurally grounded understanding of paramilitarism in the context of political tensions, social conflicts, and the economic restructuring occurring through capitalist globalization. Some of these issues will also be addressed at more length in my forthcoming book (Sprague, 2019). Anglade, Boaz. 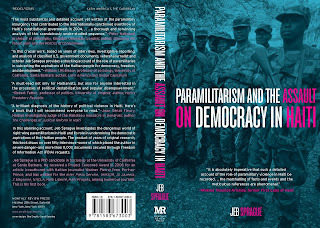 (2014) Review of Paramilitarim and the Assault on Democracy in Haiti, Race & Class, Vol. 56, No. 1, pp. 104-106. Barker, Michael. (2012) “Paramilitarism in the Age of Democracy,” The Bullet, E-Bulletin No. 718. Davidson, Matthew. (2016) review of "Paramilitarism and the Assault on Democracy in Haiti," Haiti: Then and Now. Fernandez, Belen (2012) Review of Paramilitarism and the Assault on Democracy in Haiti. Al Jazeera-English. Gros, Jean-Germain (2015) review of "Paramilitarism and the Assault on Democracy in Haiti," Journal of World-Systems Research, Vol. 21, No. 1, Winter/Spring, pp. 232-235. Gutierrez, Jose (2015) review of "Paramilitarism and the Assault on Democracy in Haiti," Social Movement Studies: Journal of Social, Cultural and Political Protest, Vol. 14, No. 4. Hallward, Peter (2008) Damming the Flood: Haiti, Aristide, and the Politics of Containment. London, UK: Verso. Pierre, Hyppolite (2013) “Democratic Struggle in Haiti: Jeb Sprague’s Account,” Eurasia Review. Podur, Justin (2014) Review of Paramilitarism and the Assault on Democracy in Haiti, Journal of Colonialism and Colonial History, Vol. 15, No. 3. Poinsette, Bruce (2013) “New Book Details History of Paramilitary Violence inHaiti,” The Skanner. Kaussen, Valerie. (2015) review of "Paramilitarism and the Assault on Democracy in Haiti," New West Indian Guide, Vol. 89, No. 1-2, pp. 116-118. Scherr, Judith (2012) “Book Exposes Violent Role of Paramilitaries in Haiti,” Inter Press Service. Smith, Matthew J. (2013) "Review of Paramilitarism and the Assault on Democracy in Haiti," WorkingUSA: The Journal of Labor & Society, Vol. 16, No. 3, pp. 411-413. Sprague, Jeb. (2012) Paramilitarism and the Assault on Democracy in Haiti. New York City, USA: Monthly Review Press. Sprague, Jeb (2017) "Haïti : le capitalisme des paramilitaires," América Latina en movimiento. Sprague, Jeb (2018) "Global Capitalism, Haiti, and the Flexibilization of Paramilitarism," Third World Quarterly. In Press. Sprague, Jeb (2019) Globalizing the Caribbean: Political Economy, Social Change, and the Transnational Capitalist Class. Philadelphia, USA: Temple University Press. Forthcoming. Taylor, Joe (2013) Review of Paramilitarism and the Assault on Democracy in Haiti, National Community Activist Network. Terrall, Ben (2012) Review of Paramilitarism and the Assault on Democracy in Haiti. Counterpunch. Tomes, Adam (2012) Review of Paramilitarism and the Assault on Demolcracy in Haiti. Counterfire. Wisskirchen, Christian (2012), “Paramilitarism in Haiti continues … and is the US (once more) lending a helping hand,” Haiti Support Group.